These are my Aquae Tanks. 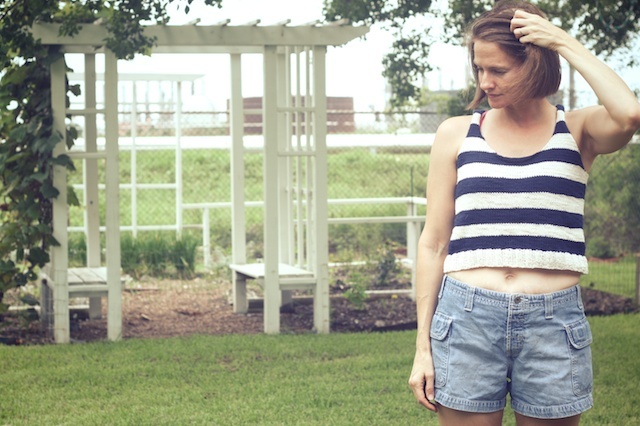 The pattern, by Hilary Smith Callis, is the perfect summer tank. The straps are wide enough to hide other straps, I can used worsted to knit it up quick, and stripes!! I did find the speediness of it made for good modifying as I went. 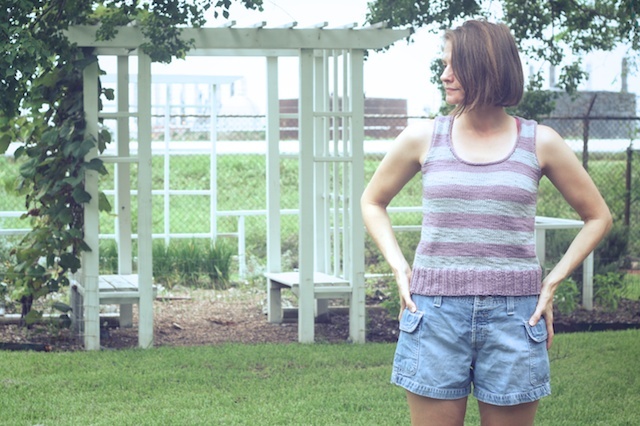 For this summer tank I felt the need for ease, so I did no waist shaping. In the spirit of ease, I carried my unused yarn colors down, along the inside of the work, twisting them together every other row. I detest weaving in ends, so this left me with very few. Since it hangs a little loose, these twisted strands don't affect the silhouette. I'm liking a more cropped sweater lately, so I stopped knitting the body after 12 stripes, then did 20 rows of 2x2 ribbing. It is 19.5 inches long. 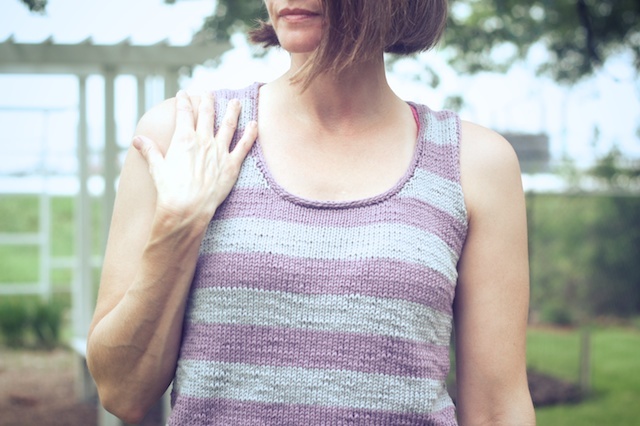 I did try the ribbed neckline, but I know how I am- that I'd never get the tension right in my bind off to keep it from sagging or flipping outward, so I went with an I-cord bind off, like some others did on Ravelry. I used the same method for the armholes. I always finish my I-cord bind offs by using Kitchener stitch to join the last 3 remaining stitches on the needle with three that I pick up from the beginning of the bind off. I'm not sure if that's the right way or not, but it looks best to me. I love the resulting top. I don't have to think about a thing when wearing it. 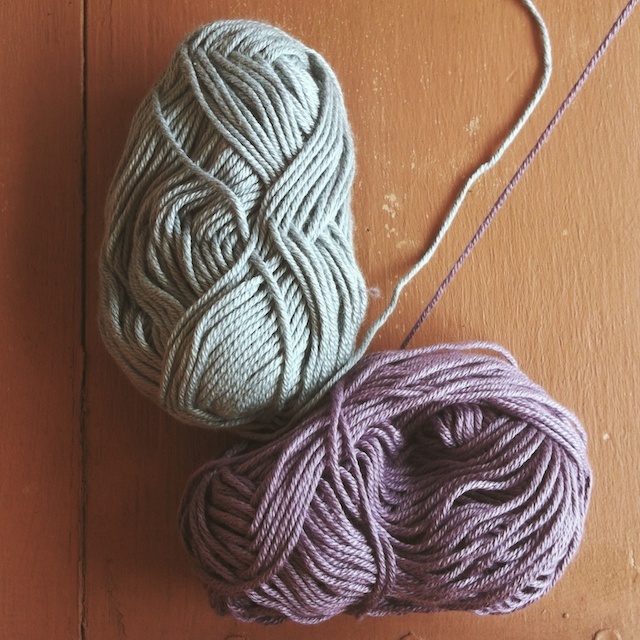 It hides other straps pretty well, is easy care yarn, and the generous amount of ribbing holds its shape well. Everything worked so well on this top that I decided to make another with all of my Oud Tank leftovers. I knew I might run short so I planned to go very cropped with this. Think beach tank. As I mentioned in my last post, I ran even shorter of yarn and had to get creative, i.e. more relaxed about the final product. I did the same mods as far as shaping, carrying my yarn along the inside. I also cropped this slightly higher. I stopped the body after 11 stripes and finished with only 10 rounds of 2x2 rib. The final length was about 18 inches. The neckline and armholes were left raw because that's the breaks, and it is just a beach t-shirt. I find they don't look tacky at all, just not quite as polished as the first version of this tank. You can find my previous post on these tanks here. Oh my goodness, you are just rocking the summer tops this year, aren't you! Way to go of two great new makes. Seriously, now I want to make one WHY ARE YOU DOING THIS TO ME!! lol I love both versions, but for some reason, the casual and cropped beach version is my favourite. Looks so casual and relaxed and I can just imagine it tossed over a bathingsuit. Those really are adorable! I love the crop! I know, me too! Who would think a last minute, thrown together project could look so cute? 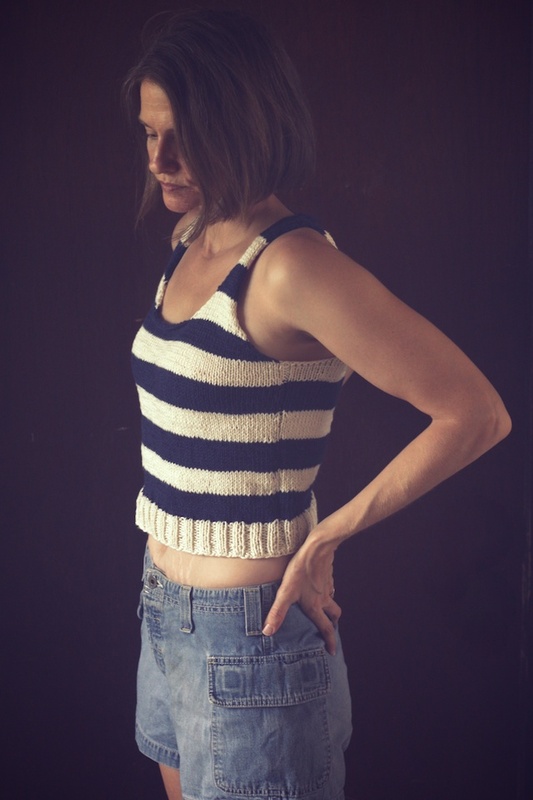 Summer tops get the serious wear around here, so I've devoted a good bit of my knitting time to them. I'm surprised that I didn't hate knitting so much with cotton. 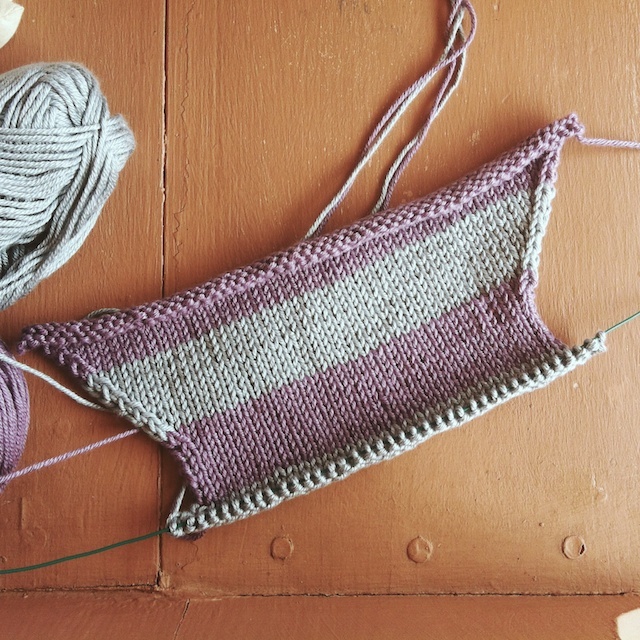 As far as making people want to knit, I'm just preparing myself for the onslaught of fall patterns. I really, really need to stick with my queue and the yarn I've accumulated, but I know they're going to mess me up!